I have been thinking about starting a project to build a homebrew system and am open to any ideas or suggestions. Plus I am just interested in looking at what other people have built at their homes! Whatta ya got? 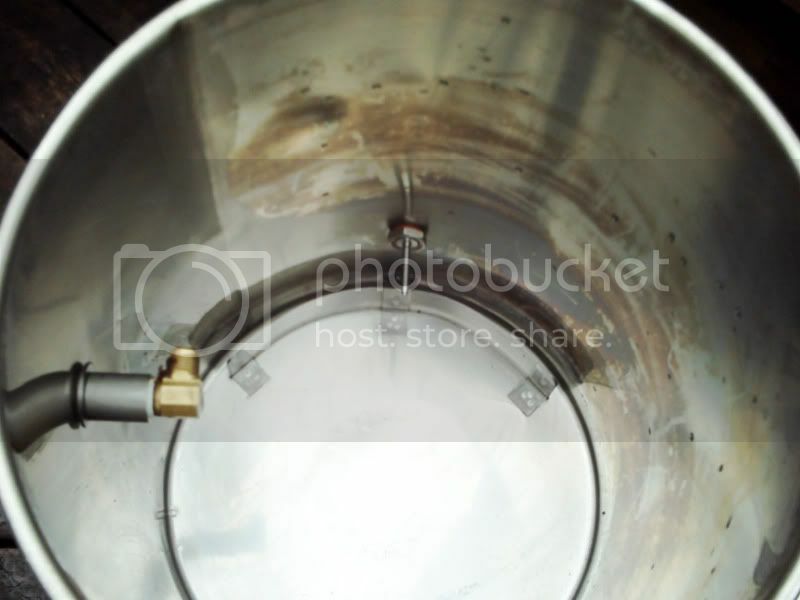 Here's my mash tun. I batch sparge because it's easier. I can start it and ignore it for an hour or two. I just use a turkey burner with a stainless steel boil kettle for the boil. 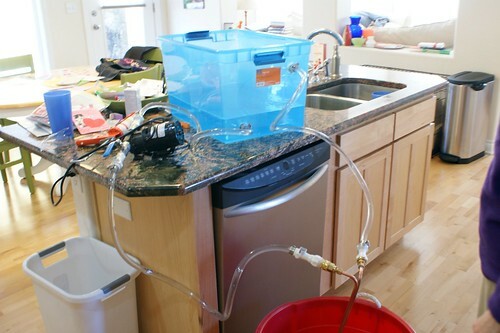 Here's how I used to chill the beer using a counterflow chiller. Here's my current wort chiller. The blue tub holds ice water that is recirculated through an immersion chiller. It's all pretty simple. You can click on the images to embiggen. 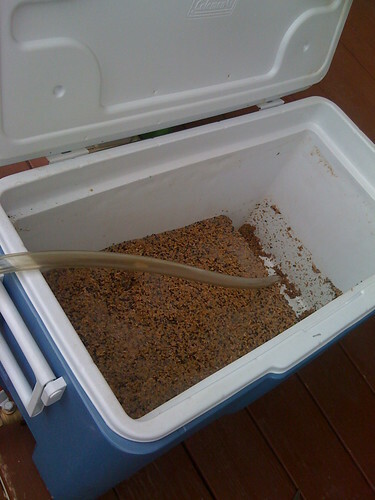 Here's other homebrew pics if you want to see more. I guess you could call it a system. That's awesome! I might have to borrow that idea. It drives me nuts how much water I waste during chilling. Yeah, I have basically the same setup. I go through a lot of ice but at least I'm not pumping dozens of gallons of water into the driveway. Isnt it dangerous to drivers with you brewing out on the street like that? I know it would be to the drivers behind me if I was passing by....screetch! Im loving Denny's system. I pictured his as one of those gigantic high tech set ups. His system is looking just how mine is shaping up to be.I feel so much more confident now. Thanks! I really have no desire to "go big". It fits my needs and brewing style. I love cooking, but I don't need restaurant equipment to do it. 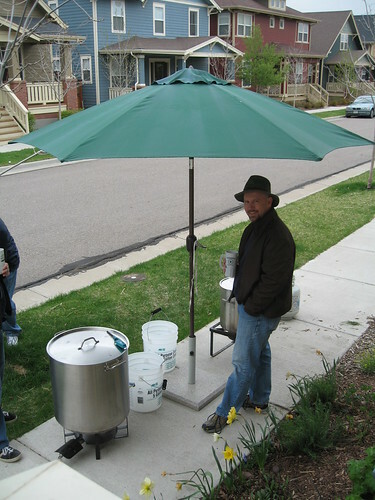 I love to brew, but I'm a homebrewer...I don't need to emulate a commercial brewery. I prefer the hands on approach. Not only that, I'd rather spend my time brewing than building equipment. Why do ya think they call him "cheap and easy"? Mine is not that much more complex than his except I use a pump to recirc during chilling with my IC. I use QDCs and have the top recirc valve plumbed directly into the kettle. Makes connecting a snap ... literally! Yeah, less is more. Ill have to say I do enjoy working on the equipment. But Im not sure how much time a fancy set up will save. 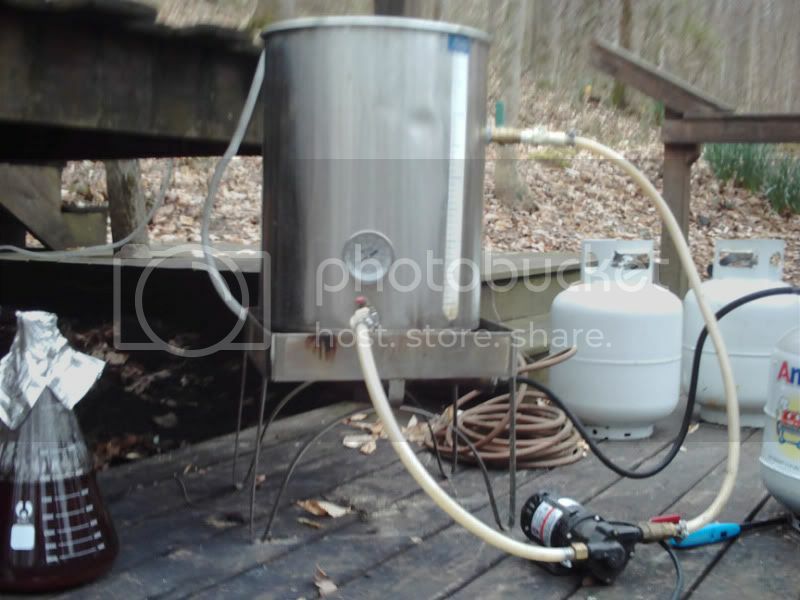 I dont have a whole lot of AG experience but sure seems to me that a simple set up and the batch sparge system is the way to go. 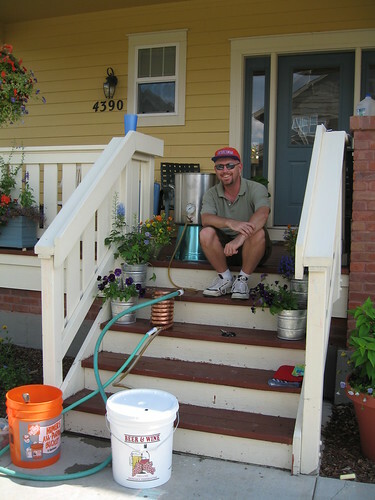 Im gonna stay that route and put my brewing dollars into a fermenting and kegging system. Hey major, I seem to remember a picture of a gigantic stand and kettle. That's the 1.5 bbls system. This is my homebrew set-up. If you'd known me back in my rock'n'roll days, you'd know there's another reason I was called Cheap'n'Easy... I admit that I've added a pump for recircing during chilling, too. Maybe not cheap, but definitely easy! But I haven't gone as far as the QDs and fancy plumbing. LOL! Somethings you just can't shake. I got a buddy to drill the hole and picked up the QDC used and cheap. I was tired of having to set my return tube just right to get the recirc motion going. BTW: Take a look at my "cheap and easy" homemade IC chiller in the back ground of the top picture. Funky is the new beautiful! I thought that was a wadded up drop cord but I now see that beautiful copper patina.